White all around. Clean and crisp, sophisticated and savvy. Can’t get distracted by color on this photo shoot. Continuing with Events by Emma’s Highstyle shoot, this theme is bold and stylish from the body art paint to the mood lighting. Very honoured to see Curtis Moore’s photographs get featured in Style Me Pretty. 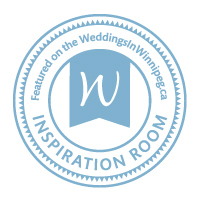 And, of course, seeing it featured on Weddings In Winnipeg is equally as impressive.